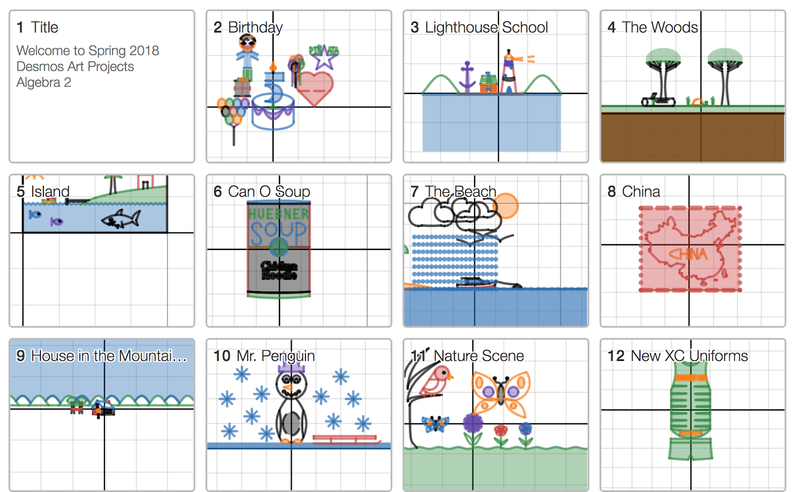 I have had my Algebra 2 students make an art project using Desmos for a few years now. However, now there are so many online, I wanted to remove opportunity to cheat so we made a few changes. I also wanted to use just tech and not paper. I used to have the students find a picture, drag it in and write the equations to make the picture. Then, they would have to do out two systems of equations - one conic and non-conic and 2 conic intersections. They had to print out their picture and color it, put it on construction paper and print out all their equations (usually 100-600 equations, although I didn't put a number on them) and then their algebra work to solve the systems. This year, I had them make original pictures. They had to include some shading. I didn't teach conics this year, so less emphasis on that although they could/should include some of those equations because they did them in geometry last year. They did not have to print out the picture or the equations. I created a google doc and had them paste their desmos link in there. Then, I took their link and pasted it into my own desmos activity builder (with a little help from twitter - paste it into an equation window in the graph window. I am very impressed with the results. I found a rubric online and modified it. 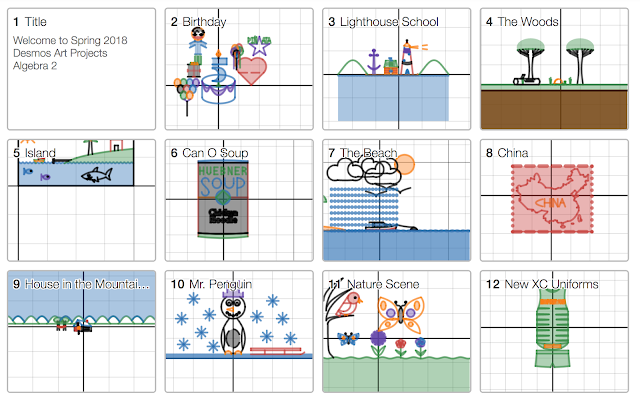 Desmos Project. (not remembering to whom to give credit, sorry).